GWANGJU, South Korea (Reuters) - Park Byung-kyu once led Kia Motor's union in the city of Gwangju, fighting for labour protections against the powerful, family-run chaebol that dominated the economy during South Korea's rapid industrialisation. But about 20 years ago, Park was assaulted by unionised workers wielding steel clubs after he campaigned for the rights of temporary workers at another company, leaving him paralysed on the right side of his body. The attack also left him disillusioned with the approach of South Korea's forceful and often militant unions, which have faced increasing criticism for protecting their interests at the expense of other workers. Now, Park is working for the city of Gwangju on a proposed joint venture with Hyundai Motor Co to build a new low-wage car factory, Hyundai's first new factory in South Korea in 25 years. The $616 million plant would create 1,000 jobs, but at less than half the wages of Hyundai's unionised workers and without many of the privileges they currently enjoy. "The labour unions with vested interests should change. If not, their interests will be taken away," said the 53-year-old Park. "Unionised labour should face up to the reality." 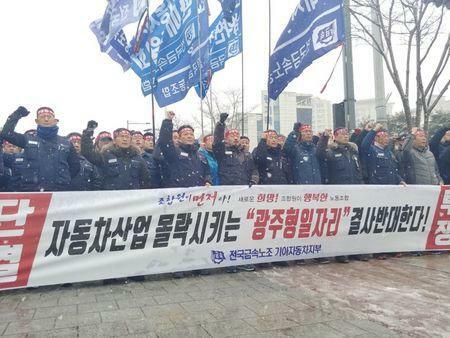 The unions of Hyundai and affiliate Kia Motors, which together form the world's fifth-largest automaker by volume, have staged strikes and rallies to protest the plant. They say it will create "bad jobs" and take away production and employment from existing factories. But in a city that has seen a steady exodus of manufacturing jobs move to low-cost countries, many job seekers say they would work for the plant in a heartbeat. Employment is a key focus for President Moon Jae-in's administration as Asia's fourth-largest economy struggles to create jobs in the face of a slowing China economy, U.S. trade protectionism and increased minimum wages. The Moon government plans to provide financial assistance to the Gwangju plant, and also introduce similar government-business ventures in two other cities by June. Officials hope it will lead to a “U-turn” of Korean companies which would otherwise build factories overseas. "This is a bold experiment to resolve jobs and labour relations problems," said Park Myung-joon, a senior research fellow at state-funded Korea Labour Institute, who has been involved in the project since its beginning in 2014. The carmaking venture, the first of its kind in South Korea, is the biggest threat to date for legacy unionised auto workers, who have largely maintained high wages and benefits even with youth unemployment near a record high and the economy sluggish, Park said. "The expensive union jobs will gradually disappear." The proposed Hyundai factory will offer annual wages of 35 million won ($31,492) - just over a third of the average 92 million won that existing Hyundai workers earn, but higher than the average 33 million won salaried workers make in Gwangju. Home to Kia Motor's largest domestic production facility, Gwangju is South Korea's No.2 motor city after the southeastern city of Ulsan, generating over 40 percent of its manufacturing output from the auto sector. Like Ulsan, which has declined as Hyundai production has retreated, Gwangju's fortunes have waned as Kia's output fell to its lowest level in eight years last year. Gwangju is now South Korea's second-poorest metropolitan city, with average monthly wages some 13 percent below the nationwide average in 2017, according to labour ministry data. Kim Jae-seung, who studied business management in college, said he is willing to apply for a blue-collar job at the planned plant. "Its wage is still above the average worker's wage. In that sense, it is not a bad job. It is a good job," the 32-year-old Kim said at a recent job fair held at the city hall. Other job seekers in Gwangju interviewed by Reuters said they too were interested given high levels of unemployment among the city's younger workers. "There are not many quality jobs out there. Given the current economic situation, I will be thankful for the 35 million won wage," said Goh Chang-hoon, a 27-year-old law major. Park, the former union leader, first proposed the low-wage factory in 2014 and later took a leave of absence from Kia to work full-time for the city government. Park said he borrowed the idea from Volkswagen's now-defunct low-cost division Auto 5000, which was created in 2001 to keep jobs from moving out of Germany. The project came to end in 2009, after the automaker won wage concessions from its powerful and highly paid legacy workers. The new factory would have an annual capacity of 100,000 mini, gasoline-powered SUVs starting 2021. Gwangju also hopes to make electric vehicles at the plant in the future, although it has yet to be agreed with Hyundai. James P. Rooney, an international finance professor at Sogang University in Seoul, said to be successful, the plant should make electric cars. “The joint venture shouldn’t be thought of a place of getting away from union and high labour cost. It should be based on the product of the future, not product of the past." Hyundai said it has decided to participate in the project, because the city, local community and the joint venture pledged to "build collaborative labour relations and maintain proper wage levels". "Under such conditions, we believed that we would be able to secure competitiveness when we outsource mini-vehicle production to the newly created corporation," Hyundai said in a statement to Reuters. Kim Yong-gu, chief executive of Hyundai Hitech, a Gwangju-based parts supplier for Kia, is hoping the new Hyundai factory will help make up for reduced output at Kia. Kia's Gwangju plant produced 455,252 vehicles last year, well short of its production capacity of 620,000. “Kia can’t make the car with current labour costs," Kim said. In addition to lower wages, the joint venture will break away from the union's tradition of striking almost every year during annual wage talks. South Korea’s reputation for militant unions and rigid labour practices has long been cited as contributing to high labour costs and a persistent discount for corporate Korea. To make up for lower pay, Gwangju plans to build 1,100 homes as well as daycare and gym facilities in the factory complex, with the central government's help. The plan is not without its critics, who question the wisdom of adding another plant at a time when automakers are grappling with excess capacity amid sluggish domestic demand, falling exports to the United States and weak sales in China. Auto production in South Korea is expected to fall to 3.65 million vehicles this year, just three quarters of total capacity of 4.66 million vehicles, auto unions say. They also argue the project is politically motivated, with Gwangju long a political stronghold of Moon's liberal government. “We have been agonizing over how to create jobs at a time when low growth and low employment have become structural issues," Jung Tae-ho, the presidential job secretary, said at a recent briefing. “The project will be key to revitalising the struggling local economy." Local officials acknowledge the plan is not the panacea to all the problems Korea's manufacturing industry faces, but say it can show one path forward.